Caitlin Christman earns a save for the Lady Wave in run rule win over the Lady Skyhawks. Greenville’s Grace Shaffer picks up the win over Fairborn in relief. 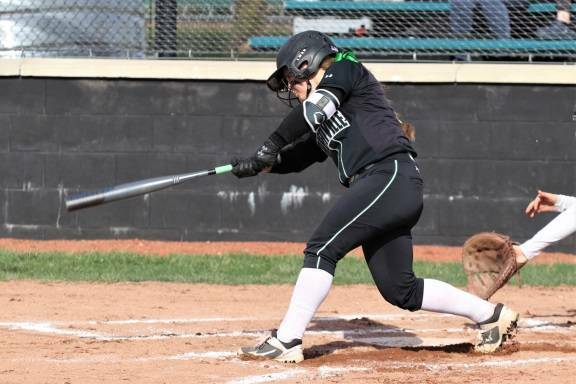 Haleigh Mayo-Benkens knocks one of her three hits on the day in Lady Wave run rule win over Fairborn. 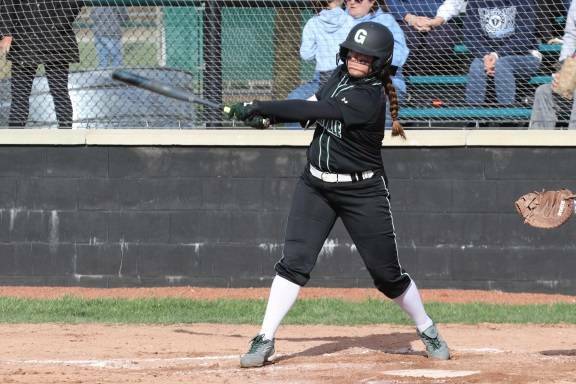 Kennedy Fashner drills a grand slam homerun for the Greenville Lady Wave in run rule win on the Fairborn Lady Skyhawks. Morgan Gilbert picks up one of her three hits on the day in Lady Wave win over the Skyhawks. 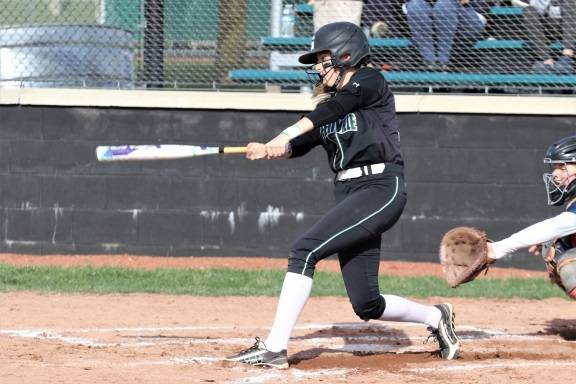 GREENVILLE – The Lady Wave battled back from a 3-0 deficit in Friday night’s GWOC game against the Fairborn Lady Aviators to earn a 16-6 run rule win over the Division I team with Kennedy Fashner driving in six runs on the day for Greenville. Prior to the game Coach Newland predicted a final score of 16-6 with the Lady Wave on the winning side. Down 3-0 before making their first appearance at the plate, the Greenville girls erupted for 10 first inning runs to lead 10-3 with one inning in the book. Morgan Gilbert led off the bottom of the first for the Lady Wave with a single to center and a walk to Lani Shilt set up a deep home run over the center field fence off the bat of Susi Blocher, the Lady Wave’s freshman first baseman’s first career home run in a varsity uniform tying the score at 3-3 with one down. A Natea Davidson one-out double to center scored on a Haleigh Mayo-Behnken two-out single to left giving the home team a 4-3 advantage. Three consecutive walks plated a run for Lady Wave and a Shilt bases loaded RBI single made it a 6-3 score bringing Lady Wave sophomore Kennedy Fashner to the plate to drive a deep grand slam home run to straight away center and give the Greenville girls a 10-run first inning to lead 10-3 after one complete. Gilbert knocked a line drive single to left to open play for the Lady Wave in the bottom of the third, moved to second with a Shilt walk and scored on a RBI Fashner single to right. Shilt scored on a Davidson groundout to third giving Greenville a 12-3 lead after three. The visitors plated three runs in the top of the fourth to cut Greenville’s lead to 12-6 where the score would stand after four innings of play. The Lady Wave used a Fashner RBI double to right and a Mayo RBI single to center upping Greenville’s lead to 14-6 after five innings. 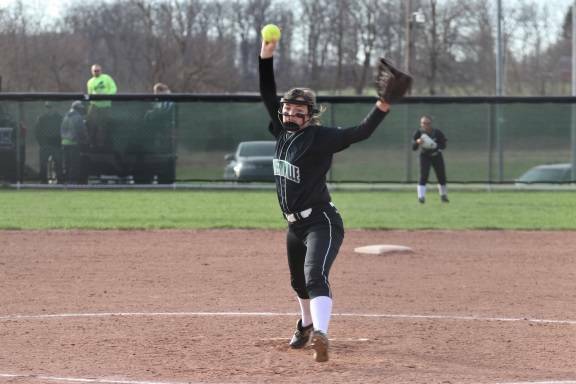 Gilbert led off the bottom of the sixth with a single to left, Shilt reached by way of an error setting up a walk-off 2-run single to left off the bat of Nyesha Write to give the Lady Wave a run rule win over Fairborn. The Lady Wave pounded out 13 hits on the day led by Fashner going 3-4 with 6-RBIs and a run scored. Gilbert was 3-4 with a walk and 4-runs and Mayo-Behnken went 3-4 with a RBI and 2-runs scored. Shilt was 1-2 with 3-walks, a RBI and 5-runs scored, Blocher went 1-3 with a walk, 3-RBIs and 2-runs and Davidson was 1-4 with a RBI and a run scored. Fashner started for the Lady Wave and encountered control problems early bring Grace Shaffer to the mound to record the win for Greenville allowing seven hits and three runs over 2.1 innings, striking out one and walking one. Caitlin Christman threw 3.0 innings in relief. https://www.dailyadvocate.com/wp-content/uploads/sites/34/2019/04/web1_8-inch-Caitlin-Christman.jpgCaitlin Christman earns a save for the Lady Wave in run rule win over the Lady Skyhawks. https://www.dailyadvocate.com/wp-content/uploads/sites/34/2019/04/web1_8-inch-Grace-Shaffer.jpgGreenville’s Grace Shaffer picks up the win over Fairborn in relief. 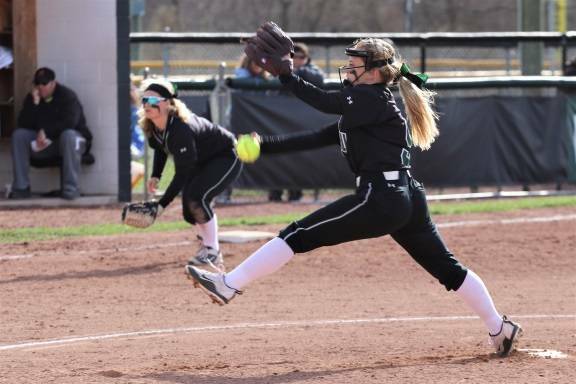 https://www.dailyadvocate.com/wp-content/uploads/sites/34/2019/04/web1_8-inch-Haleigh-May-Benhken.jpgHaleigh Mayo-Benkens knocks one of her three hits on the day in Lady Wave run rule win over Fairborn. 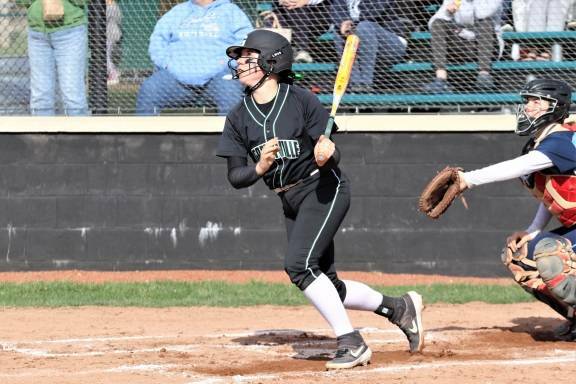 https://www.dailyadvocate.com/wp-content/uploads/sites/34/2019/04/web1_8-inch-Kennedy-Fashner.jpgKennedy Fashner drills a grand slam homerun for the Greenville Lady Wave in run rule win on the Fairborn Lady Skyhawks. https://www.dailyadvocate.com/wp-content/uploads/sites/34/2019/04/web1_8-inch-morgan-gilbert.jpgMorgan Gilbert picks up one of her three hits on the day in Lady Wave win over the Skyhawks.